George has danced Argentine Tango and other Latin dances for over 15 years and has been teaching Argentine Tango and Latin dance for the last ten years. Also for the last 10 years, George has been actively writing music, creating choreography and performing. George's songs have a more lyrical and popular nature, avoiding the monotonous tape-loop sound, while incorporating the sounds of classic instruments such as the bandoneon, piano, guitars and strings and adding sounds of instruments such as the flute, clarinet, oboe, sax, and drums. ORDER Weightless Slumber through PayPal using george@inscenes.com as the email address or send an email to george@inscenes.com including your name & delivery address and a confirming shipping date and invoice will be emailed back to you. Prices: $13.85 in the U.S. (shipping included plus $1.15 tax, CA only). Include $2US shipping & handling for deliveries outside the U.S.A.
"Hi George, thank you very much for the CD. We both enjoyed it very much! The lyrics were lovely and your voice had a different sound which was quite appealing with very soothing music. I favoured the songs: "Part of Me", "Hooked on You", and "Shadows". It is great that you are doing creative work which seems to vibrate throughout your being. Keep on creating! Con muchos recuerdos y Buena Suerte con la musica! P.M.
"Hi George, Sorry for the late response. I wanted to listen to it again, but this time together with my wife. We both liked your new CD a lot! It is very nice to listen to; good singing and good music. Sincerely, we are very impressed by the multiplicity if your talents. I hope the CD will be very successful!" C.E. "As a musician, George's new CD "Weightless Slumber" really talks to my soul. The orchestration is rich and superb! As a flute player, I can really appreciate the many flute solos. I love the duets of the bandoneon, oboe, piano, guitar; every song is a perfect balance of instrumentation, voice, rhythm. The melody is engaging and creative and the lyrics are pure poetry that will romance your heart. As a dancer, I'm in heaven. As a singer, I enjoy the warm sensuality and tonality of George's voice transporting me to a world of sweet dreams. This is a great gift to give to someone very special to you." T.P. "George, I wanted to let you know how thrilled I am with my purchase of your CD, Weightless Slumber. I couldn¹t wait to tear open the cover and insert it into my player. And I was not disappointed. Not only is the music lovely to listen to, with rich instrumentals and your sweet voice, but I've enjoyed dancing to several songs on the CD. I'm looking forward to your next CD!" P.O. "George Nicol has created a moving CD of ballads that evoke feelings of joy, passion, and love lost and found. Listen closely, and you'll discover hidden meanings and nuanced layers. "Weightless Slumber" is a rich tapestry of instrumentation and lyrics that inspires listeners and dancers alike. I'm "hooked!" M.K. 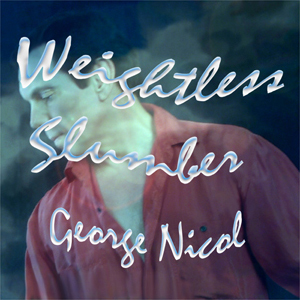 "Weightless Slumber" by George Nicol is a burst of sentiment and romance with his lovely voice and accomplished musicians from Buenos Aires. Sung in English, the lyrics are nevertheless reminiscent of Spanish lyrics heard in tangos which bewail found and lost love. A beautiful CD for lovers!! E.L.S. "I just got a chance to hear your new CD, "Weightless Slumber," and I wanted to let you know how much I enjoyed it. I especially liked the songs "Rivers and Walls," "Weightless" and "Part of Me." I thought all the musical arrangements were excellent and quite unique. I particularly liked your use of instruments such as the bandoneon." P.B.